After visiting Carsten and Sandra in Chemnitz the previous night, I was on my to hit one more mountain before heading north for Kiel. At 7am I crossed the Polish border and even though the GPS announced the town of Karpacz to be only 80kms away, it took me more than 90 minutes to arrive there. This was due to a combination of fog, bad roads and the fact that many cop cars lined the roads and I did not want to risk getting a ticket for speeding. Another factor contributed to my slow progress. It was Sunday, Nov 1, and therefore the Day of the Dead or All Saint's Day. Apparently this is a very important holiday in catholic Poland, because there were traffic jams at every cemetery that I passed. Cops were out regulating traffic and cars were backing up for kilometers (all this at 7am in the morning mind you, and it would be even worth on my way back). Every available space near a cemetery's entrance was packed with stands selling grave ornaments and flowers (mainly Chrysanthemums) and entire family in their fine Sunday-church-going outfits were strolling to the graves of their relatives. Interesting experience. So at 8:30 or so as I was approaching Karpacz, I could make out the Krkonose mountain range and its obvious highpoint, Snezka. Karpacz is a fairly good-sized city, that stretches along the main road leading through town. Accordingly, I was not sure where to park and where to start the hike. I had hoped for some signs, but did not immediately find any. I asked a few younger people thinking they would understand my English, Deutsch and Francais, but to no avail. Eventually, I parked and asked a older lady if she could show me the trailhead for the hike. I was lucky, because in broken English she told me that I was near the trailhead and that she would guide me there. She was with a friend and the two of them were -what else- on their way to the cemetery to leave some flowers. The cemetery turned out to be the one belonging to the Vang Church and she pointed out the cobblestone road that gradually lead up in the general direction of the summit. Thanking the two ladies I went on my way. I was on the trail to reach a hut by the name of Samotnia, a very scenic place near the col. Following the blue markers for about 90 minutes got me there. I only met a couple of guys coming down during that time. Maybe they had spent the night at the hut, but when I got there I found little activity indicating that it was still open for the season. After the Samotnia hut, it took me another 30 minutes or so to reach Równia pod Sniezka, which is right at the col and the starting point for the last 20 minutes of the hike to cover by following the black markers the remaining 200 meters in elevation. It was a beautiful day and only when I got to the Równia did I start meeting more people. Maybe they were all Czech and coming up from that side of the mountain (as the Polish-Czech border runs through the summit. For the last 200 meters in elevation I left the main and still cobblestoned path and hiked up a smaller path in switchbacks to the summit. Only at the very top did I encounter some snow and slippery conditions (there was a via ferrata-like cable to provide security the entire way). The summit was packed with snow and with people. It was Sunday and a beautiful fall day, which explained maybe much of the crowdedness. There is an interesting summit structure at the top, which was just being renovated. Workers were climbing up and down the scaffolding of the structure, yelling at each other loudly and listening to crappy music (Paparazzi) on a radio. This sort of dimmed my elated feeling of having tagged another summit, but what can you do. I asked another hiker if he could take my summit picture. Again I did not get very far with my English, Deutsch or Francais, but by pointing at the camera and then at myself I got the message across and he took my picture (I then returned the favor and took one of him). I spent another 15 minutes at the summit checking out the various summit structures, before getting ready to decend. At the summit restaurant I wanted to inquire about the chair lift, which I had not been able to locate in town and which apparently offered a quicker and more relaxed way to get down from the mountain. The lady at the counter did not understand what I was trying to say, but she yelled for a lady from the kitchen who spoke some German. First I thought she understood that I was just wanting to know how to get there, but I was actually asking if it was operating. She said something in Polish and when I said "kaputt" in referring to the lift, she smiled and nodded. I wasn't in a smily mood, for that meant that I had to hike back down the way I came. Even though that is not the issue, I was dreading the long drive I had to get on later in the day and wanted to get started as soon a I could. Oh well. I hiked back down to Równia and then in the spur of the moment decided to do a loop and descend another way than the one I had taken up. I took the descent route through the Lomniczka Valley, following the red markers. This was fairly steep and slippery at first. It was the north face of the mountain so to speak and the snow that had melted in other place was still firm and slippery. I passed a couple of memorials with metal signs and even pictures of those unfortunate to have died here in the past (quite a few actually). Even more carefully I continued until eventually the path leveled out and the snow disappeared. I ran into a couple of people including an older gentleman who explained to me in perfect German that he was visiting this part of the country as often as he could in order to "clear his head", but then was pretty much on my own again for the rest of the way. 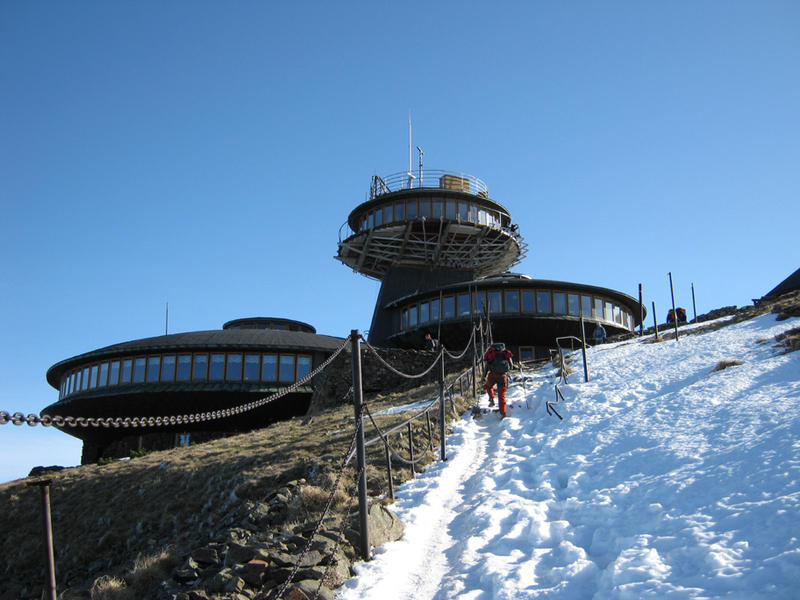 I passed the Lomniczka hut and after 90 minutes or so reached the paved road at the entrance to the national park. From here I found my car in another 15 minutes and was soon on my way west only to be stopped again for 10 minutes at an overflowing, traffic jammed cemetery. The second hike of the day took place many hours later and was not really much of a hike. On my way to Berlin I drove all the way through the state of Brandenburg to the south of Berlin. I had researched the high point, the Heidehöhe, beforehand, just in case I would came close to it during my travels. And sure enough, when I programmed the nearest town, Gröden into my GPS on my way up to Berlin, I found that it was only 30km of my current position at the time. I took the next exit and followed the indications given by my GPS's friendly voice. It was already 4pm and a bit overcast, and I was fearing that I would not find the summit in time before nightfall. The Heidehöhe is just above 200m high and I thought that it was just another plateau with a non-distinct highpoint that one can only guess. Fortunately, in the town of Gröden there were already signs pointing to the Heidetower (Heideturm). My internet research had not revealed such a sight that I thought must be marking the summit. Therefore I headed straight towards it, following the signs. At first I arrived at a dead-end because the signs were marking an approach via bicycles, but on my second attempt I followed a couple of narrow but paved roads through a dense forest and eventually arrived at a clearing in whose center stood….et voila… the Heide tower. Night was falling quickly, so I grabbed my camera and ran up the stairs in order to take at least one picture from the top. The weather was bad and low hanging clouds and fog impeded most of my view and the lack of light prevented me from taking any beautiful summit shot except for one self portrait. Oh well, I would have to come back some day, but then, maybe not. On my way down I studied the documentation lining the walls of the tower and explaining that it had just been constructed a year earlier. This explained the lack of proof of its existence I had found online. A few other people were milling around, that had arrived on foot, by bicycle, by car or by tractor-drawn wagon. But I did not stay much longer, got in my car and returned to the interstate to continue my drive to Berlin where I was to spend the night.